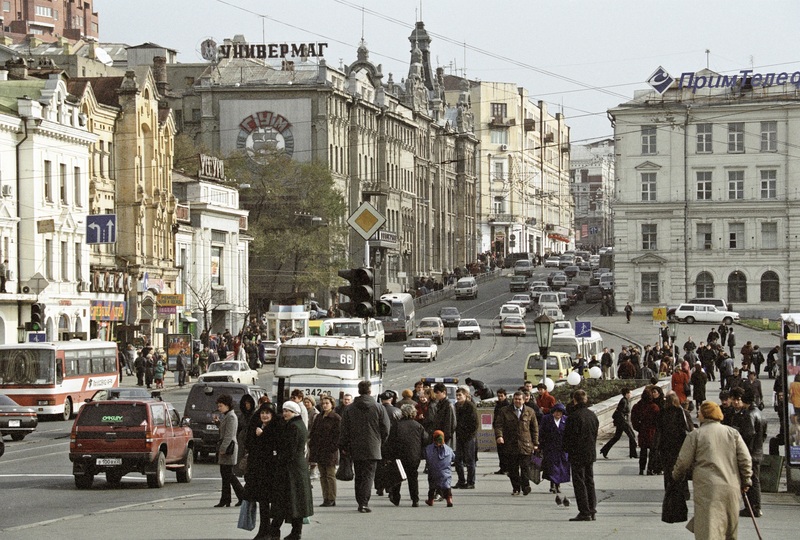 Vladivostok before its makeover in 2012. Few countries have changed as much over the last decade as Russia has. While the changes are mostly positive, there was a distinct charm about the period when the country was in a transition period after the Boris Yeltsin years. The first thing I noticed on my first day in Russia nearly 14 years ago was the fact that Muscovites shunned eye contact. Whether they were giving directions to strangers or sitting in the metro, no one ever seemed to look at anyone in the eye. Flash forward to the summer of 2016 where the main exit of the metro station near the Novodevichy Convent was under renovation. As someone who has a tendency to get lost, I was wandering off the right path and reluctantly asked a middle-aged woman for directions. She smiled at me and then started explaining the way before assuming that I’d never find it and then escorted me for a few minutes until it was a straight path. I was indeed living in another era where the suspicious and unfriendly Moscow had given way to a new mindset among the people. Moscow and all of Russia have almost changed beyond recognition over the last decade. I seriously doubt whether the country “sparkled” like this even in the best days of the Soviet Union. The higher standards of living, restored buildings and parks and general sense of security definitely make a Russia a better country than it was ten years ago, but the adventurer in me feels a deep sense of nostalgia for the old days. In the 2000s, the country was in a transition phase. The instability of the Boris Yeltsin years was a thing of the past, but the effects of those wild days (as well as the last days of the USSR) were visible. Several new laws were put into place but few understood them. I was once told by the railway police in the city of Komsomolsk-na-Amure that my visa was valid only for Sakhalin. And this was in 2003! I tried telling them that the Soviet Union no longer existed and that if I followed registration procedures I had the right to travel almost everywhere in Russia with my Russian visa. A senior police officer then said with a smile they would let me go “just this once.” He knew that I knew the new rules better than his own team. Street crime was prevalent and teenage gangs roamed the main thoroughfares of many cities. Although I was only robbed once, and that too by a gang of Azerbaijani immigrants who were arrested soon, I honed my street survival skills in those days. Being an Indian in the Russian Far East meant that I could be spotted from miles away. Walking on the streets meant a lot of wanted (from lovely women) and unwanted (from gopniks or petty criminals) attention. There was one particular incident in the Siberian city of Novosibirsk that had me a bit unnerved. After three fun days in the city, I was out clubbing with my friends. As we left the nightclub, we saw some larger than life and mean-looking young men sitting outside on a bench. I clearly felt the gaze of one of them and tried to quietly walk past him but he gently tapped me. So, my friends and I thought this could turn into a street fight. As I looked at him, the young man said in flawless English, “your shoe laces are untied.” I smiled and thanked him and he replied with a Namaste! That felt completely surreal! Those were the days before the Goa tourist craze and most people still thought of India as the country they saw from old Hindi films. I felt like a pioneer when I travelled in Vladivostok, Khabarovsk, Kamchatka and across the Siberian landmass. There was a great opportunity to be an unofficial youth ambassador for India and create a good impression about the country. As a Bombayite turned Far Eastern Russian, I found Moscow to be an intimidating place, a decade ago. There were random stories of skinhead attacks and police stopping visible foreigners for document checks. I fortunately didn’t experience any of these kinds of unpleasant incidents. My Sakhalin friends had poisoned my mind with their impressions about the capital. A decade later, Moscow is a second home for me. It’s a place that can hold its own with any of the world’s greatest cities. At one time, locals and guidebooks used to advise people to avoid the metro after 10 pm. It’s just amazing how much things have actually changed. After a summer evening concert at the botanical garden on Mira Avenue, I took the metro just before closing time (1 am) and was happy to see so many young and cheerful people heading home. People were out to socialize and not to create trouble. St. Petersburg and smaller cities across the country feel even safer. Yes, despite the nostalgia I feel for the 2000s, I am absolutely grateful for the wonderful changes that I have seen in Russia over the last decade and a half. Ajay Kamalakaran is RBTH’s Consulting Editor for Asia. Read more of his articles here. Follow Ajay on Twitter and Quora.